Yesterday, I spent the morning with my daughter’s Pre-K class (as well as the Kindergartners in her school). A few weeks ago, they had been read a book (How to Make an Apple Pie and See the World by Marjorie Priceman). Afterward, the teacher asked them if any of them had ever tried apple pie. Apparently, my child not only raised her hand to signal that she had, she also told the two classes that, “My mommy makes the best apple pie ever.” One of the teachers then asked me if I would like to bake an apple pie with the kids. How could I resist? Cooking with kids is a passion of mine! I thought about how we would do this and wanted to throw in a little extra craft into the mix. I’m so lucky that the teachers at the Academies at GBDS are generous with their time and allowed me to really delve into this fun project with their classes. We started out making the dough. Every single child participated – they measured and poured the ingredients. We counted and added. I was impressed by their math skills! Then. we all took turns mixing. They cut up the butter (with butter knives, naturally) and then we mixed everything together in the food processor. Next, we needed apples. Lots and lots of apples. Though only some kids felt comfortable enough to peel, every one of those children cut up apples into little chunks. Some didn’t know how to hold a knife. Some were obviously well versed. Within a few minutes, everyone was cutting properly and making our filling come to life. We needed to add spices to give our filling flavor. I’m a big believer that kids need to understand what goes into their food and they should always taste new things. I shook out a tiny bit of cinnamon on each child’s hand and they each had a taste. Most of them liked the earthiness they felt and some even asked for more! With the nutmeg and allspice, I had them take a whiff. Those are overwhelming spices to taste directly. Not too many fans of those smells, so it’s a good thing they didn’t stick them on their tongues! Once the filling was ready, we “rolled” out our dough. The kids smushed the dough between parchment paper until it was almost the size of the “pan” and I helped them by rolling it out a bit more. They then pressed the dough in, filled their pies and used long pieces to form the lattice. We didn’t have enough dough for a full lattice, so they made simple star shapes instead. Cute, right? Well, I wanted them to have a fun take-out bag so the pies would make it safely home. I cut some apples (and notched them so they’d be easier to hold) and had the kids stamp apples onto their lunch bags. 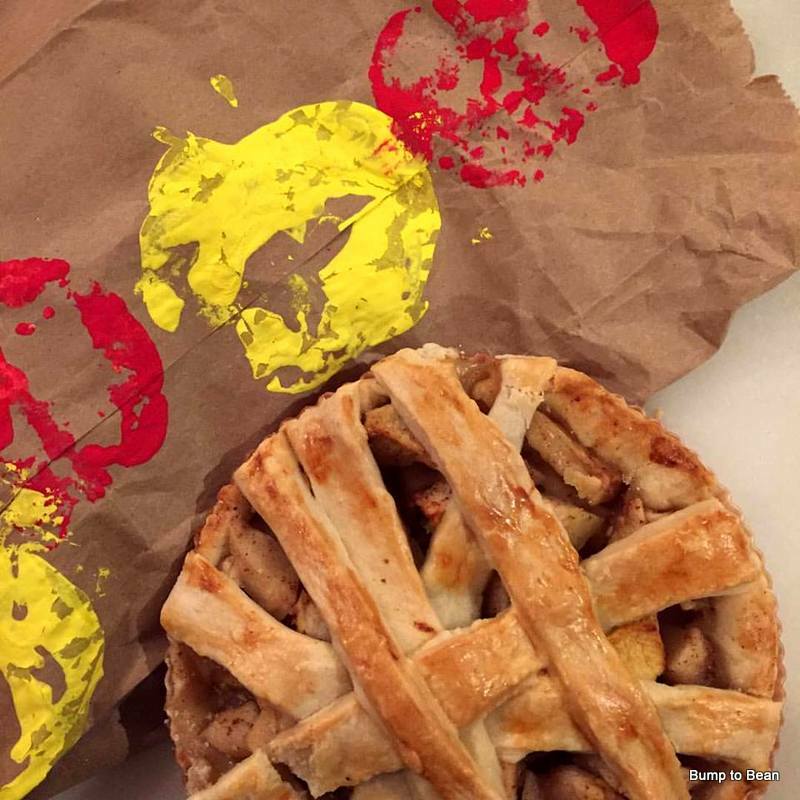 The pies went into ziplocs for protection and then into the brown bags. Within two hours, we had our pies in the oven and the bags out to dry. 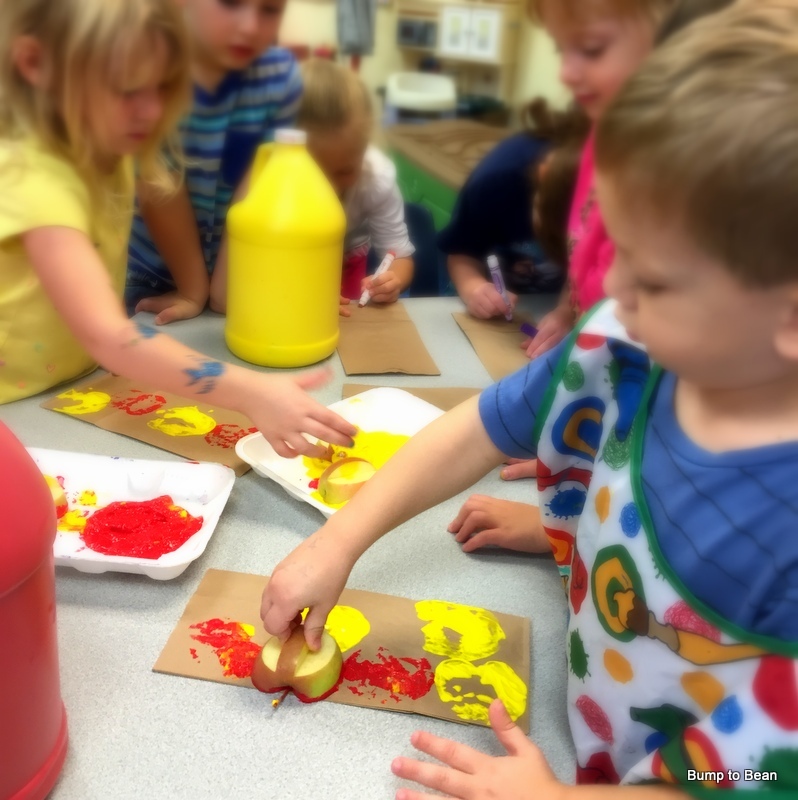 Such a fun activity to do with kids when apples are in abundance and readily available. This recipe is so easy, even four year olds can master it. So, if you’re looking for something to do once you’ve returned from picking apples at the orchard, I hope you’ll give this a whirl. Pulse flour, salt and sugar in a food processor fitted with steel blade until combined. Add butter pieces over flour mixture; pulse butter into flour until mixture is pale yellow and resembles coarse crumbs, about ten 1-second pulses. With the food processor running, add vanilla and ice water over mixture. Mix just until it all comes together on the blade. Divide dough into two pieces, one slightly larger than the other. Flatten larger piece into a rough 5-inch square and smaller piece into a 4-inch disk, Wrap separately in plastic and refrigerator at least 1 hour or up to 2 days before rolling. Remove one piece of dough from refrigerator (if refrigerated longer than 1 hour, let stand at room temperature until malleable). Roll dough on lightly floured work surface or between two large sheets of parchment to 12-inch disk. Transfer dough to pie plate. Working around circumference of pie plate, ease dough into pan corners by gently lifting dough edges with one hand while pressing around pan bottom with other hand. Leave dough that overhangs lip of plate in place; refrigerate dough-lined pie plate. Peel, core and cut apples in half, and in half again width-wise; cut quarters into 1/4-inch slices and toss with lemon juice and zest. Add honey, vanilla, flour and spices. Toss to combine. Turn fruit mixture, including juices, into chilled pie shell and mound slightly in center. Roll out second piece of dough to 12-inch disk and place over filling. Trim top and bottom edges to 1/2-inch beyond pan lip. Tuck this rim of dough underneath itself so that folded edge is flush with pan lip. Flute edging or press with fork tines to seal. Cut four slits on dough top. If pie dough is very soft, place in freezer for 10 minutes. Brush egg white onto top of crust and sprinkle evenly with 1 tablespoon sugar. Bake pie at 374 until juices bubble and crust is deep golden brown, 40-45 minutes. Transfer pie to wire rack; cool to room temperature. Great post! I absolutely love cooking with my daughter! We will make this recipe and tell you how it turned out! Post a picture here and on our Facebook page! I’d love to share in your pie, even if it’s just in a visual sense! Have fun.